By now we have all heard of the devastating situation caused by the earthquake in Haiti. We have also been tweeted and facebooked many times about how we can help. We may also have - in the midst of our feelings of empathy and compassion for those effected by this unimaginable tragedy - felt that we are having a tough enough time ourselves right now and that as much as we'd like to help, we are unfortunately not in a position to do anything given our own personal financial situation right now. We at The Powder Group understand how difficult this year has been financially for so many in our community - artists, brands, educators alike - and have also been working hard just to stay afloat. That said - we hope that each and every one of us can take the time today to consider how lucky we are and how good we have it considering the difficult, insurmountable times that are ahead for the people of Haiti. We implore each of you in the Global Makeup Community to do whatever you can - as little or as much as that may be - to help the cause and make a difference today. We have compiled a current list of some links and information that we hope will be helpful to help you make decisions about how you can help. Our thoughts are with the people of Haiti and all of you who have family or friends who have been effected by this tragedy. 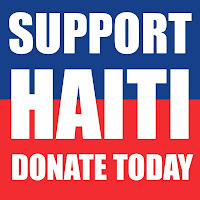 Text "HAITI" to 90999 to donate $10 to Red Cross Hait Relief Fund. The cellphone carriers will not be taking any of the profits. Text "YELE" to 501501 to donate $5 to the fund. *To date Yele and Red Cross have together generated over $1 million in SMS message donations. Please keep the money coming! Canadians text "HAITI" to 45678 to donate $5.00 to The Salvation Army's efforts in Haiti from any Rogers Wireless or Bell Mobility phone. Donors will then receive a message asking them to confirm their donation with a YES reply. The proceeds of each text donation will support the ongoing efforts to serve the victims of the recent horrific earthquake that has left thousands dead and many more without adequate food, clean water or shelter. When you make a purchase the cashier will ask if you would like to make a donation for Haitian relief. $1, $5, or $10 amounts may be donated. Each of the following organizations have fund raising efforts in place to earmark donations for Haitian relieft. The main page of their websites provide details. -Microsoft has pledged $1.2 million in cash and will match employee contributions of up to $12,000 per worker as a part of their ongoing matching gift program. -Walmart has donated $500,000 cash and $100,000 in prepackaged food. -Verizon has pledged $100,000 and will match employee contributions of up to $1,000 per worker. - Humana Inc is donating $100,000 and matching from associates on a dollar for dollar up to an additional $50,000 for a total donation of $150,000. -Bank of America has made a $1 million commitment, including a $500,000 grant to the American Red Cross for the Haitian Relief and Development Fund. The remaining $500,000 contribution will be directed towards the long-term recovery efforts. -Many companies including Design Within Reach, M Booth & Associates Public Relations and Intel are sponsoring matching gift programs for their employees. Check with your business about this type of program to maximize your support! -Viacom announced a $500,000 matching-gift program, with donations going to the Red Cross' disaster efforts. * Please be cautious when spreading any support information, make sure it is correct so that our efforts are not in vein. * Please note that the above information has been developed as a public service and that the information listed is as accurate as possible. Donors should take measures to ensure the legitimacy of their donation sites. The Powder Group is not liable for any errors or omissions nor liabilities of donors or organizations above.